I went to London last weekend, and while there I visited the Tate Modern. One of the exhibitions showcased brutalist architecture around the world, and it was here that I saw the lifeless, scarred concrete sculpture* of the Lebanese Burj al Murr. The thing was as tall as I am, and it slammed into my imagination with ruthless brutality. Located in down-town Beirut, this ugly 40 story tower dominates the skyline. In times not at all long past, it also dominated the city in a different way. 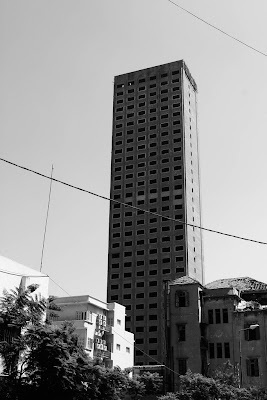 The construction of the Murr Tower was begun in 1974, and when the Lebanese civil war erupted in -75, 28 of the tower's floors had been completed. Despite the unrest, the work continued until the whole structure had been erected. Battle-scarred even before it was finished, the tower found it's function in 1978, as a sniper-position that could dominate and terrorise the surrounding city, two kilometres out from it's base. Even when it was planned, it was never destined for success. Already by 1970's standards it was impractical, with it's narrow construction providing little office-space, and limited parking. Today the concrete monolith is out-dated, and many think the best thing to do is to simply knock it down. The problem here is that it is too high to topple, and too solid to implode. Given a period of peace and stability, this monument to broken dreams and civil war could be taken down, but it still stands, dominating Beirut. The Burj al Murr was doomed from the start. Some say it was cursed, but that is not at all accurate -- its not as if anyone cast a spell on the tower. It was conceived in a time of optimism, but even in it's planning, it was never destined to fulfil it's intended role. When the war began, the fighters quickly realised the tactical advantage the tower could offer those who controlled it. Taller than any other building in the city, and solid enough to withstand the weapons used on the battle-field, it was perfect. As the war raged on around it, it started to absorb the fears of those who lived in it's shadow. Nightmares and terror seeped into the concrete, mixed with blood of both innocents and the guilty, the tower became something more. In Beirut, the tower can be seen on both sides of the Gauntlet. On the material side it looks like an ugly, tall skyscraper. In the Shadow, however, it can be seen for what it has become. Gray and scarred, it seems to rise into the sky. The streets surrounding it is littered with burnt out vehicles and partially collapsed buildings. Wherever you are in the city, you feel the need not be in the tower's line of sight. This is a feeling that is hard to define, but those who have been in the Shadow of Beirut have all felt this urge. The tower itself is a Locus, a place of power where the material and the immaterial worlds meet. It would be too simple to say that the Burj al Murr is responsible for all the violence and unrest in Beirut over the last decades, but the tower feeds it, and feeds from it. Spirits and ghosts feeding on the various emotional energies of hatred, revenge and civil war are drawn to the tower, and more stalk in it's shadow. *Monument for the Living, by Marwan Rechmaoui. What an ugly damn building. Yeesh! I love your take on it, it being visible on both sides of the Gauntlet. Very fascinating stuff. Of all the things I saw at the gallery, that ugly lump of concrete was what made the greatest imression. When I started looking into the history of the building itself, I kinda had to do my part to make it known. "Noen fortjener en god død."